A shopper has claimed she found a "cry for help" note hidden inside a pair of trousers alleging slave labour conditions in a Chinese prison. The note, wrapped in a prison identity card, claimed inmates were forced to work 15 hours a day making clothes. Karen Wisínska said she bought the trousers in Primark's Belfast store in June 2011 but had never worn them. She discovered the note just last week. A Primark spokesperson said the firm has begun an immediate investigation. The writer of the note claimed inmates were forced to work "like oxen" and were given food that would be considered unfit for animals. It is not yet known if the allegations made in the note are genuine. Mrs Wisínska, who lives in County Fermanagh, Northern Ireland, bought the trousers during a shopping trip to Belfast three years ago, but had never worn them because when she took them home, she found the zip was broken. She put them into her wardrobe and did not take them out again until last week, when she was packing clothes for a holiday. She said it was only at that point she discovered the note and the prison identity card inside a pocket of the trousers. Mrs Wisínska said she knew it was some sort of plea for help because the letters SOS were written across the top, but she could not understand the rest of the writing. She posted the pictures of the items on Facebook, and when she received rough English translations of the note, she said she was "in shock" and "felt sick". She then contacted human rights campaigners at Amnesty International. "I was shocked to find this note and card inside the trousers from Primark and even more shocked to discover that it appears to have been made under slave labour conditions in a Chinese prison," she said. "I am only sorry that I did not discover the note when I first purchased the clothing - then I could have brought this scandal to light much earlier." Amnesty's Northern Ireland programme director, Patrick Corrigan said: "It is a horrific tale. "It's very difficult to know whether it's genuine, but the fear has to be that this is just the tip of the iceberg," Mr Corrigan added. 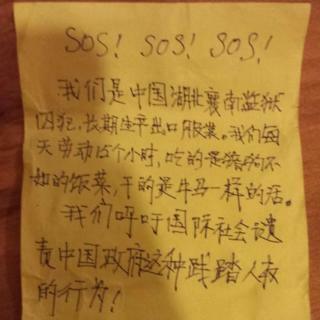 The note, translated into English, reads: "SOS! SOS! SOS! We are prisoners at Xiangnan jail in Hubei, China. "For a long time, we have been producing clothing for export. We work for 15 hours each day. What we eat is even worse than food for pigs and dogs. The work we do is similar to (the hard work) that oxen and horses do. "We urge the international community to denounce China for this inhumane act," the note said. A Primark spokesperson said the firm has started an "immediate, detailed investigation" and would be contacting Mrs Wisínska. In a statement to the BBC, the clothing retailer said: "These three-quarter crop trousers were last ordered by Primark in early 2009 and were last sold in Northern Ireland in October 2009. "We find it very strange that this has come to light so recently, given that the trousers were on sale four years ago. We will be contacting the customer to obtain the trousers, so we can investigate how this occurred and whether there are issues which need to be looked into. "Nine inspections of the supplier have been carried out by Primark's ethical standards team since 2009. To be clear, no prison or other forced labour of any kind was found during these inspections," the statement said. The spokesperson added the firm "actively investigates all allegations of breaches of its code of conduct immediately to ensure the well-being of all workers in its supply chain". Primark is among large clothing firms that have come under close scrutiny in recent years over how and where they source their products. Concerns have been raised about the employment conditions of staff in developing countries who work to produce garments that are then sold cheaply in UK high street firms. Last year, more than 1,100 people were killed and 2,500 were injured when the Rana Plaza garment factory in Bangladesh collapsed. Primark was among the retailers that sourced clothes from the factory. The firms faced criticism for a lack of collective action to improve the working conditions in Bangladeshi garment factories. To date, Primark said it has paid over $12m (£7m) in aid and compensation to support the victims of the Rana Plaza disaster. In its statement to the BBC, the firm said: "Primark's code of conduct sets out the core principles that suppliers must follow to ensure products are made in good working conditions, that the people making them are treated decently and are paid a fair wage. "Primark is a member of the Ethical Trading Initiative (ETI), and our code is based on the ETI base code. We inspect each factory to ensure it is meeting our code requirements and support the factory by providing guidance and training if issues are identified." The retailed said it had carried out more than 2,000 factory inspections last year alone and employs a team of "over 45 professionals dedicated to maintaining the standards set out in its code". On Monday, Primark also released a statement in response to an unrelated case when a separate note was allegedly found inside another of its garments. At the time, the firm said: "We are currently investigating the origins of an additional label which has been found inside one of our dresses implying that the garment was produced under poor working conditions. It added: "We have asked the customer who discovered the label to return the dress, which has not been available for sale since 2013, to us so we can fully investigate how the label became attached and whether there are issues which need to be looked into."